Many thousands of people who visit NKT~IKBU Centers worldwide each year, receiving teachings and meeting practicing Kadampas, will attest to this. There are also some short internet teachings that give a sense of the accessibility of Kadampa Buddhism available on the main Kadampa website. There is a growing number of personal blogs by Kadampa Buddhist practitioners talking about how they integrate Kadampa Buddhism into their daily lives and use it to solve their own and others’ problems. Interviews on the main Kadampa site also give a sense of the range of Kadampas and how they use Kadampa Buddhism to transform their daily lives. These internet teachings, blogs and so on* offer a small taste of a large variety of NKT students from all different walks of life. Tens of thousands of Kadampa Buddhists are scattered all around the world, East and West – some living in Centers, most living outside and working regular jobs – and all doing their best to integrate Buddha’s teachings into daily life to find inner peace, control their minds, and help others. We hope to see many more representative Kadampa blogs, interviews and so on in the coming months and years. If you have any helpful or inspiring experiences you’d like to share, please feel free to post them to the comments section of this article. One common smear from NKT detractors is that NKT is really a money making empire of book publishing, Dharma Festivals and Celebrations, Retreat Centers, hotels, cafes and spas, and that these activities and businesses make a lot of money. Truth: As far as explicit business activities are concerned, there is Tharpa Publications (whose main purpose is to benefit others by distributing Buddha’s teachings in Geshe Kelsang’s books), and the Kadampa Hotels. To get some perspective, only three of the NKT’s Kadampa Meditation Centers (KMCs) out of over one thousand Centers and branch classes are Kadampa hotels. These are situated in Malaga (Spain), Tuscany (Italy), and South Limburg (Holland) respectively. The reason for the existence of these Hotels as KMCs is that when Geshe Kelsang and his students were looking for a suitable building for KMC Spain, the most suitable was a hotel in Malaga. Unfortunately, the local authorities would not allow a change of use for this building, which had to remain as a hotel, so Geshe Kelsang’s idea was to buy the building and operate the hotel with the KMC inside it. One of the main aims of the New Kadampa Tradition is to ‘exemplify Buddhist practice through public service’ and a hotel is a perfect medium to accomplish this. Kadampa Buddhism has cherishing others at its heart, so the intention is for guests to enjoy a stay at a hotel where all the staff have this as their heart practice. It seems so far that this attitude of the Kadampas who work in the three Kadampa Hotels is the reason for their popularity – the guests are treated with uncommon kindness and respect because the primary aim of the Hotels is to cherish others, not to make money. In any case, profits from these hotels are, as with all profits from Kadampa Buddhist Centers and Kadampa Meditation Centers, donated to the International Temples Project (ITP) for the building of Temples for World Peace. NKT Dharma Centers, whether Kadampa Meditation Centers (KMCs) or Kadampa Buddhist Centers (KBCs), often have World Peace Cafes associated with them. Some of these make a profit, but their main purpose is not financial. Their primary purpose is to exemplify Buddhist practice through public service and to act as a means by which the public can connect with Buddhism, or just find out more about Buddhism and the Kadampa Buddhist communities. Profits from these World Peace Cafes are used to defray the running costs of a Center and to support Center development. Any funds that are not required for this purpose are donated to the ITP. 14§7. The profits from each Festival and Dharma Celebration shall be used only for the NKT-IKBU International Temples Project; except that profits from the annual International Festivals held in the UK may also be used as properly required for the running of the NKT-IKBU. 18§1. Since the purpose of opening NKT-IKBU Dharma Centres is to spread NKT Kadampa Buddhism, all the assets of these Dharma Centres shall be used only for this aim. The annual profits made by each local NKT-IKBU Kadampa Buddhist Centre shall be used for the development of that Centre, including improvements to accommodation and so forth, and any remaining profit shall be donated to the NKT-IKBU International Temples Project account of their respective country. 18§2. At the end of the financial year each local NKT-IKBU Kadampa Buddhist Centre shall send a copy of their annual financial report to their NSD, to the Secretary and to the Temple & KMC Development Director. 18§3. The Directors of the NKT Charity together with the Education Council Representatives shall have the authority to prevent the misuse of the assets of any NKT-IKBU Dharma Centre. 18§4. Annual profits made by the KMCs, international Retreat Centres, Tharpa Publications and Hotel Kadampas in each country throughout the world must be donated to an NKT-IKBU International Temples Project account. 18§5. At the end of each financial year the Administrative Director of each KMC and each international Retreat Centre, the Finance Director of each Tharpa Publications and the Managing Director of each Hotel Kadampa shall send a detailed financial report to the Secretary, the Temple & KMC Development Director and the Treasurer. 18§6. All the funds in the NKT-IKBU International Temples Project accounts throughout the world must only be used for the NKT-IKBU International Temples Project and cannot be used by individual Dharma Centres or for any other purpose. With respect to the claim that the NKT makes ‘a lot of money’, all profits are donated to building Temples for World Peace. The more money that is raised, the more people around the world are benefitted through having access to these Temples and the teachings of Buddha. Some people have argued that business is necessarily bad or at least not compatible with Buddhism. But business, like any other activity, can be either good or bad depending upon the motivation with which we engage in it. Resources are necessary for benefiting others. For example Marpa (Spiritual Guide of the famous Buddhist saint Milarepa) would engage in business and use the money he made to travel to India so that he could obtain and bring back Buddhist texts for the benefit of the Tibetans. One of the six perfections that are the main path to enlightenment is giving. Through operating Kadampa Hotels, World Peace Cafes and other appropriate businesses, Kadampas have the chance to practice cherishing others, and the profits from these activities are given to others in the form of Kadampa Temples that are intended to create peace in the world. Those training on the path to enlightenment try to give up the wish to keep things for themselves and dedicate their activities and possessions to the benefit of others. In the case of Kadampa businesses, everything is created for and donated to the benefit of all living beings. NKT detractors have claimed that after Geshe Kelsang’s retirement in 2009, the General Spiritual Director of the NKT will not be a Geshe, Lama or Rinpoche, and therefore there will be no lineage for NKT in the future. This objection arises from comparing the NKT-IKBU (New Kadampa Tradition – International Kadampa Buddhist Union) with the Tibetan Buddhist tradition, feeling that it should operate in the same way. This does not have to be the case. The living lineage of any Buddhist tradition exists in the hearts of its practitioners as realizations. It cannot exist on paper or in titles such as ‘Geshe’, ‘Lama’ or ‘Rinpoche’. These titles should be given either out of respect for the example that such a practitioner demonstrates, or as a qualification (in the case of ‘Geshe’) for a particular course of academic study. In earlier times, titles and paper qualifications were not required for sincere spiritual Teachers and disciples. 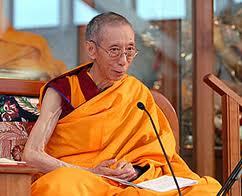 For example, Atisha was not called ‘His Holiness’ or ‘Rinpoche’ or ‘Geshe’. Even students of this great Master who were called ‘Geshe’ (meaning ‘spiritual friend’) such as Geshe Potowa, Geshe Langri Tangpa and Geshe Sharawa would not have recognised the Geshe degree that passes for a qualification to teach in the Tibetan Gelugpa tradition these days. They did not engage in such formal study – they simply listened to their Spiritual Guide’s instructions and, putting them into practice with a pure motivation, developed genuine realizations. They then passed the lineage of the instructions on to their disciples. My only good qualities are that first I made single-pointed requests to my Spiritual Guide, then I practised my sadhanas as soon as I received them, and finally I attained enlightenment in three years and three months. As it happens, the NKT-IKBU does have three study programmes, the Teacher Training Programme in particular being very rigorous, consisting of many years of study, exams and meditation retreats. Unlike the Geshe degree, it is not hampered by politics (for example, to study at the Gelugpa monasteries under control of the 14th Dalai Lama these days it is necessary to have signed a document renouncing the practice of Dorje Shugden, a political qualification stipulated by the Tibetan Government in Exile). Also, while containing many profound philosophical subjects such as Lorig (the nature and functions of the mind) and the profound wisdom teachings of the middle way, the NKT Teacher Training Programme is also very practical with the extensive study of Lamrim (stages of the path) and Lojong (training the mind). It is also meditative, orientated towards the Yogi’s way of life, with subjects such as training in meditative concentration and Mahamudra. This is unlike the Geshe degree, which emphasizes philosophical studies instead of practical and meditative ones. To complete the Teacher Training Programme requires great dedication and many years of sincere practice. The final qualifications for any NKT-IKBU Teacher to aspire to are explained in the eleven reversals. Just as the NKT-IKBU does not need to rely on traditional Geshe training, neither does the NKT-IKBU have to rely on reincarnated Teachers or ‘Tulkus’ for lineage because it is not necessary. Sadly, there are many examples in the Tibetan tradition of how the Tulku system has been abused for the sake of power, wealth and reputation. Since mistakes and worldly motivations are common in these degenerate times, it is not wise to rely upon such a system. A Teacher should be assessed on the merit of their own teachings and example, not by their reincarnation lineage or titles. The lineage of the NKT-IKBU is maintained as follows: The essence of Je Tsongkhapa’s teachings on the path to enlightenment have been transmitted to Geshe Kelsang’s disciples, both orally and in written form. These instructions contain everything required to reach enlightenment. NKT-IKBU practitioners have therefore received the lineage of all of Buddha’s teachings, and through their own sincere study and practice can become a lineage holder. The purity and authenticity of the tradition is the responsibility of the Education Council of the NKT-IKBU, consisting of the Resident Teachers of all NKT-IKBU Dharma Centers, excepting the General Spiritual Director. This system is democratic and protects against the NKT-IKBU being taken in a wrong direction by any NKT-IKBU General Spiritual Director who develops a degenerated motivation. More information about the function of the Education Council can be found in the NKT-IKBU Internal Rules. Thus, having received the unbroken transmission of the genuine spiritual teachings of Je Tsongkhapa’s tradition from Geshe Kelsang, having been authorised to transmit them by NKT-IKBU, and by relying upon Buddha Shakyamuni, the Teachers of the NKT-IKBU have the authority and blessings to transmit these precious holy teachings for countless generations to come.